I've seen 3 others of these very rare Early Chinese Communist Party Badges, one pictured in a catalog actually retained the original chain and hanger. Naturally each one has a unique membership number crudely stamped into onto the reverse. The famous Daniel Ching Collection sale catalog had one with #23853. The Duan "Comprehensive Catalog of Chinese Copper Coins" (the bible) shows one with #22249. This Membership Badge has the number #5622. Duan, Hong Gang states the same thing on p. 10 & 11. A Baldwin catalog (Hong Kong auction #50, Apr 2011, Lot # 936) shows the one with chain & hanger. 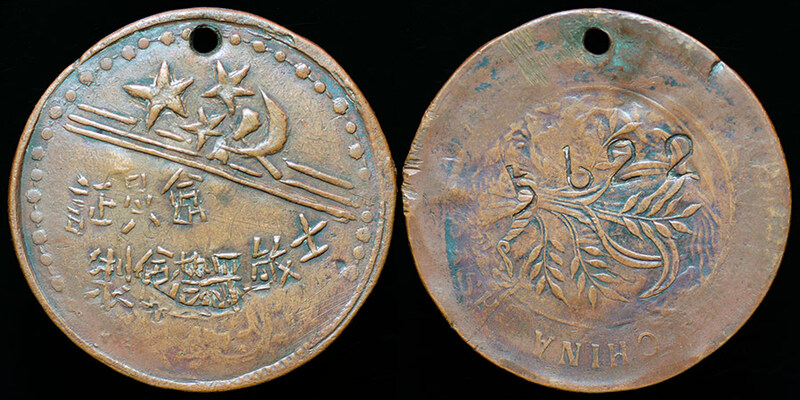 They have a different attribution: Shi Min County Farmers Society, Copper Members's Badge (1940's). A note states "Qin Shui County, Shanxi was renamed Shi Min County in commemoration of General Wu Shi Min of the 98th National Revolutionary Army, killed in the war against Japan in 1941" (ed. if so the county has reverted to its original name). However, an on-line source (generals.dk) shows him as a Nationalist Army General by inference of a flag and description as a Nationalist Army general who also fought against the communists. So it's not really plausible that Shi Min county was named after General Wu Shi-min or that he was honored by the Chinese Soviets on their membership badge. Earlier attributions site the fact that all of these Membership Badges are overstruck on Hunan 20 Cash pieces (Y 400.x; ND - 1919). The Province of Shansi, sited in the latest (Baldwin) attribution, is a long distance from Hunan, so the link there seems tenuous. Another interesting link are that most of the large star with hammer & sickle counterstamps shown here in the Moneta Museum are mostly struck on Hunan 20 Cash pieces just like the Communist Party Membership Badge.